All aboard! The sailing vessel Orenda beckons… we heed her call and embark on our tropical sail! This summer was a very hot one, not that we’re complaining but the meteorologists were spot on in their prediction, this summer was a scorcher! So we decided if ever there was a time to take to the water this was it. Enter Captain David Johanns, friend and skipper of his own unique sailing vessel the Orenda. David had been inviting us to join him on one of his evening sails for a while but somehow we never got it together. What a shame, had we known what we were in store for we would have booked multiple sails. David is not only a terrific Captain, who has been passionate about sailing since the age of nine, but he is also the consummate tour guide and host. We soon learned Captain David is a poetic storyteller. Guiding us up through the Inner Harbour and the Toronto Islands we experienced the skyline and the landmarks through a different lens and informative commentary. When we accepted David’s invite to join him on this evening sail, we were promised a tropical ride, traditional leis, cocktails and all. And so it was a date. Estimated sail time 5:00p.m. David meets us and greets his guests at the Toronto Multihull Cruising Club. At 4:30p.m. the weather was looking positive. The spirited guests were arriving at the dock ready to party! 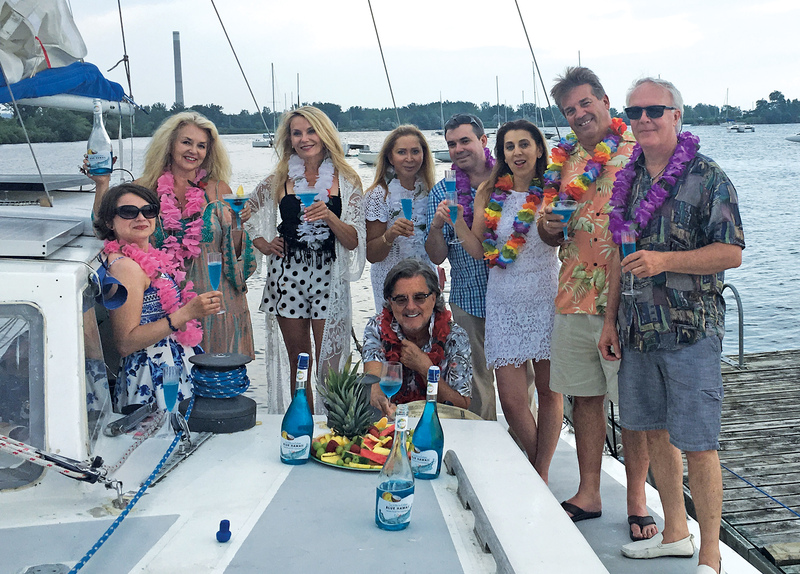 As each person stepped aboard they were handed a lei and a delectable beverage called Blue Hawaii. Coolers upon coolers of food and drink are loaded onto Orenda, “Wouldn’t want to chance being dry on the water,” pipes Kenneth, one of the guests, as another stocked cooler loaded with a very special Chardonnay hits the deck! As we unpacked the food and drink, David explains what makes the Orenda unique. He said he happened to be in the right place at the right time as it was about to be cut up with a chain saw! He recognized it as a custom built trimaran in need of a little TLC. For trimaran boat junkies, the boat David rescued is a John Piver design. It was the first of its kind to circumnavigate the globe. David, who is also a top realtor in Toronto realized its’ potential. “Just like when buying a dilapidated house, it had good bones. I could see past the plants growing on deck and racoons and rats living onboard.” Over the years he has added new electronics, new sails, new running and rigging and navigation systems while completely rebuilding and restoring the interior. It even has an electric toilet! All of this sustained by an on-board solar-system making the boat capable of truly off-grid living. Orenda, formerly called Lapwing, has a new life. In a matter of minutes, the sky turned black, not at all the forecast. The winds picked up to what our Captain says is approximately 40knots/hour. Our tropical sail was about to turn into a tropical storm! A debate as to whether we should venture out, or stay docked ensued, final votes counted: lets do it! And so within a 5 mile reach of our destination, the historic Lighthouse, the squalls build and there was lightning on the shoreline. A downpour descends upon us and we run for cover! It’s unanimous: turn the boat around, and head back to the boat club! There’s something exhilarating about a little danger, or perceived danger. To us novice guests it was exciting, all huddled in the boat, rocking from side to side, bracing the elements. And as quickly as the storm began, it was over, just like a typical tropical storm. The sun reappeared, and we ventured back out and thoroughly revel in the sail. Viewing the city from on the water allows one to truly appreciate the beauty that exists just moments from the Toronto shoreline. 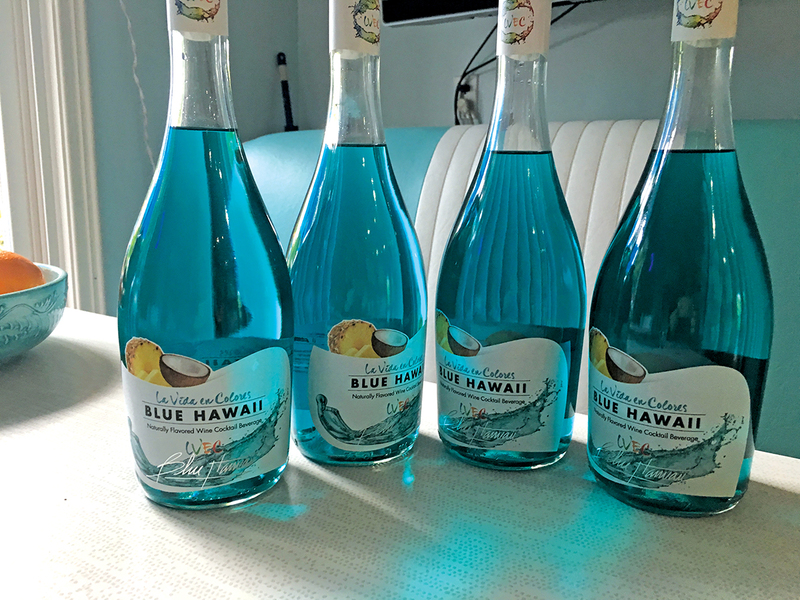 We enjoyed our refills of the delightful light and refreshing La Vida En Colores Blue Hawaii. Produced by Bottega Anecoop located in Valencia Southern Spain, it is a refreshing wine cocktail, made from the local grape variety Muscat of Alexandria. A beautiful delicately sparkling wine with natural flavors of rum, pineapple and coconut, simply perfect for the occasion, our tropical sail! Back at the boat club, David in charge fires up the barbeque. Hawaiian style burgers are on the grill, complete with perfectly charred pineapple rings! And to pair with the burgers Kenneth Gunn, one of our guests today, President and CEO of Marchands des Amériques a wine importing agency, has brought along a very special wine, Jordan Chardonnay 2014. 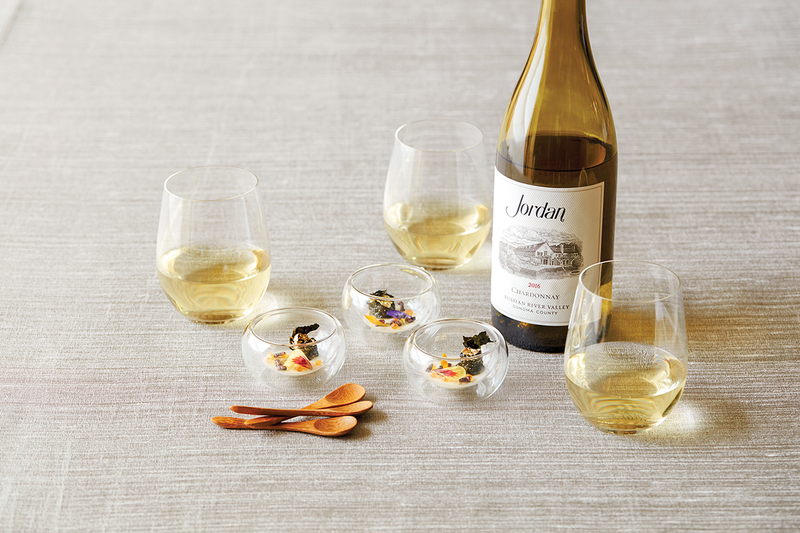 A real treat for all, Jordan Chardonnay comes from the Russian River Valley in Sonoma County, although it could be taken for a white Burgundy due to its refined aromas reminiscent of Chablis. Absolutely a stunning wine, we are eager to learn more about it. The grapes come from the east side of the Russian River. Known for its elegance, minerality, and lingering finish, it is the soil with the exposed gravel deposits that allows this luscious Chardonnay to be so unique and coveted, explains Kenneth. The wine is produced using old-world winemaking techniques and aged in French oak barrels. Jordan Vineyard & Winery was founded in 1972 and is currently run by CEO and second generation vintner John Jordan. John’s commitment to pursing the highest level of quality is evident not only in every bottle but in every aspect of the business, blending respect for tradition while incorporating the latest in technology. Examples range from energy-efficient roofs, solar arrays, and water recycling to extended bottle aging and soil-mapping studies, to name just a few. Congratulations to Jordan, the wine is divine, and thank you Ken and Gina! What an evening! Great company, surpurb food and drink and then … a sailing piano. David Johanns is also an accomplished composer, singer/songwriter and pianist. Out of the blue comes David’s electric piano, he is a showman, an incredible performer and personality. Before too long, he was taking requests, we all joined in, singing and laughing with not a care in the world. Our tropical sail was a grand success. As we thank and bid our Captain good night one of us declaresd “what an extraordinary evening”, we all concur, yes it most surely was! Truly a refreshing beverage from Valencia, beautifully packaged, a delicately sparkling wine made with the local Muscat of Alexandria grape with natural flavours of rum, pineapple and coconut. Easy drinking, it is lower in alcohol at 5%, absolutely delicious with a forward and aromatic enticing nose of pineapple and coconut. It is lightly carbonated with well-balanced sweetness and a delicate finish. Beautiful light golden in colour, with a delectable seductive aroma of pears, kiwi and lemon. Rich, round and creamy on the palate, complex with layers of lemon, stone fruits and a hint of caramel and vanilla from barrel aging. Bright and crisp with a lingering finish, simply divine! Available on LCBO.com or at Destination California LCBO Store.